Prizes Awarded to the Winners of the 2016 Artentwine Sculpture Biennial – West Tamar Arts Group Inc.
A Cocktail Party was held at Tamar Ridge Cellar Door in Rosevears to celebrate the opening of the 2016 Artentwine Sculpture Biennial and to announce the Prize Winners for all but one of the 2016 Artentwine Sculpture Biennial Awards. Paul Brunyee for ‘Odd Man Out’, installed at Goaty Hill Wines in Rowella. Serena Rosevear for ‘Native #2 (41°10’31″S, 146°55’5″E)’, installed at Iron Pot Bay Vineyard in Rowella. Samantha Dennis for ‘The Spectacle and The Swarm’, installed at Tamar Ridge Cellar Door in Rosevears. Lisa De Boer for ‘Gaia’s Light’, installed at Tamar Ridge Cellar Door in Rosevears. Kathleen Sheehan for ‘Self-identity’, installed at Tamar Ridge Cellar Door in Rosevears. The West Tamar Arts Group (WTAG) and the 2016 Artentwine Committee would like to thank all the talented Artists for creating such an interesting range of sculpture; plus thank all our generous sponsors for their support and assistance in bringing the 2016 Artentwine Sculpture Biennial into being. Without the many volunteer hours of service and goods so willingly provided by our members and friends this event would also not be possible, and the WTAG Committee thanks each and everyone of you for contributing to this event. Please support our sponsors, and let them know you appreciate their efforts in bringing this event to the Tamar Valley. Find out more on our Artentwine Website where you can also view the NEW 2016 Artentwine Sculpture Biennial CATALOGUE. WHO WILL WIN THE 2016 Artentwine $1,000 Bell Bay Aluminium People’s Choice Award ? 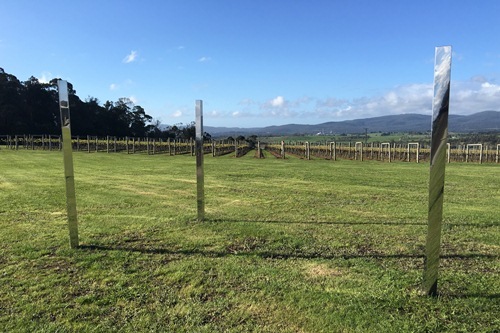 VOTE NOW AT THE ARTENTWINE VINEYARDS… Winner to be announced at the LONG LUNCH at Moores Hill Estate in early November, 2016.